Cropping a photo in Photoshop Elements is probably one of the easiest things you can do to improve the composition of your photo. Getting rid of the unnecessary background around your subject creates a better focal point. Select the Crop tool from the Tools panel in either Edit Full or Edit Quick mode. You can also press the C key. Specify your aspect ratio and resolution options on the Options bar. Crop tool settings on the Options bar. No Restriction: Allows you to freely crop the image at any size. Use Photo Ratio: Retains the original aspect ratio of the image when you crop. Preset Sizes: Offers a variety of common photographic sizes. When you crop, your image then becomes that specific dimension. When you crop an image, Elements retains the original resolution of the file (unless you specify otherwise in the Resolution option). Therefore, to keep your image at the same image size while simultaneously eliminating portions of your image, Elements must resample the file. Consequently, your image must have sufficient resolution so that the effects of the resampling aren’t too noticeable, especially if you choose a larger preset. Width and Height: Enables you to specify a desired width and height to crop your image. Resolution: Specify a desired resolution for your cropped image. Again, try to avoid resampling your image. Pixels/in or Pixels/cm: Specify your desired unit of measurement. Drag around the portion of the image you want to retain and release the mouse button. When you drag, a crop marquee bounding box appears. Don’t worry if your cropping marquee isn’t exactly correct. You can adjust it in Step 4. The area outside the crop marquee appears darker to allow for easy framing of your image. 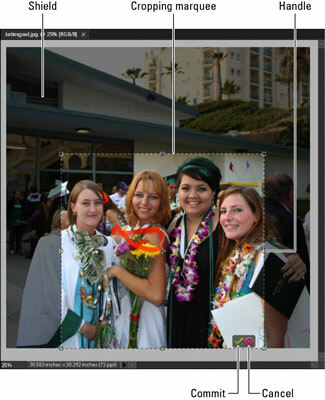 Adjust the cropping marquee by dragging the handles of the crop marquee bounding box. To move the entire marquee, position your mouse inside the marquee until you see a black arrowhead cursor and then drag. If you move your mouse outside the marquee, your cursor changes to a curved arrow. Drag with this cursor to rotate the marquee. This action allows you to both rotate and crop your image simultaneously — handy for straightening a crooked image. Just be aware that rotation, unless it’s in 90-degree increments, also resamples your image. Double-click inside the cropping marquee. You can also just press Enter or click the green Commit button next to the marquee. Elements then discards the area outside the marquee. To cancel your crop, click the red Cancel button. You can also find the Crop command in the Organizer in the Fix pane. You can crop an image by choosing Image→Crop in either Edit Full or Edit Quick mode. First, make a selection with any of the selection tools and then choose the command. You can use this technique with any selection border shape. That is, your selection doesn’t have to be rectangular. It can be round or even freeform. Your cropped image doesn’t take on that shape, but Elements crops as close to the boundaries of the selection border as it can.